Seismic surveys are extremely loud, and repetitive, with air gun blasts several times a minute, lasting for weeks. Their sounds can generally be heard underwater for dozens of miles, though in near-shore waters, propagation can be reduced. Several studies have shown that some species of fish avoid the immediate area of surveys, potentially for a week or more after it ends; however, not all fisheries appear to have been so affected, and it’s not readily clear how close the fisheries of concern are to the survey area. Likewise, it’s not clear from news reports whether the survey is close enough to bottlenose dolphin habitats to create a heightened threat to mothers and young; the coast of New Jersey is subject to intense shipping noise, which bottlenose dolphins apparently tolerate. This is yet another example of increased concern about human noise at sea, a concern we obviously share here at AEI; however, we have also often seen well-intentioned citizens and officials assume the worst in the face of these relatively rare academic seismic survey projects. 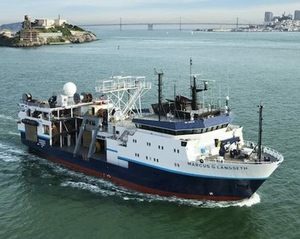 Given all the industrial seismic that occurs in our oceans, along with chronic shipping noise, it’s not so clear to us that occasional academic surveys are as dangerous as they are sometimes made out to be. In general, our experience leads us to tend to trust the NOAA/NMFS experts who assess these projects, and to be calmed by the fact that larger seismic surveys undertaken by the oil and gas industry around the world (including intensively in the Gulf of Mexico) have apparently had relatively little effect on local populations of sea life—though the question is difficult to really investigate, given the range of insults to Gulf waters. That said, digging into the project planning documents for this survey, and learning more about the seasonal sensitivity of the species of concern, might show this to be a project that deserves further scrutiny. Time will tell whether a federal judge is able to provide such scrutiny in a timely manner; or, if lacking the expertise to do so, defers to federal regulators and allows the survey to proceed, or to the concerns of the plaintiffs by imposing temporary restraining order pending a full consideration of the claims made in the lawsuit.